You are responsible for ensuring that your home is insured for the correct amount. That’s why initio thinks its important to make sure you understand what should be included in your sum insured. If you have built your home, you might be thinking, its easy I insure it for what it cost to build. But that isn’t always correct. When you built your house, there would not have been an allowance for demolition and removal of debris. Chances are in a total loss, there will be a lot of prep work; demolishing the remains, and taking them away, before the rebuild can even begin. These costs will be higher again if your property contains asbestos. You also have to take in to account inflation, making allowances for increases in building costs that might occur during your period of insurance. Its not just the house that you need to consider; its also any other permanent structures on the property. 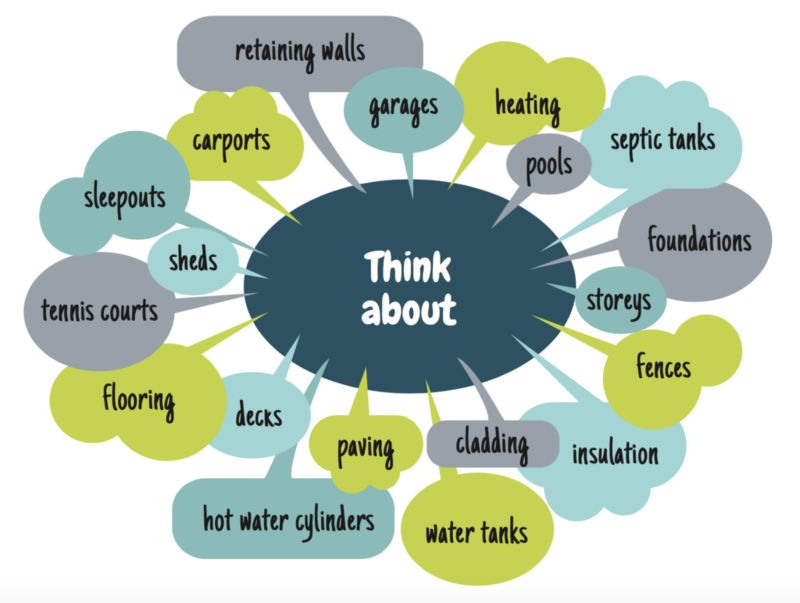 So think about the walls, gates, fences, swimming / spa pools, paths and driveways constructed of concrete, brick, pavers or tarseal, patios, tennis courts, garden sheds, garaging and retaining walls. Lastly, think about you location. Maybe your property is down a step driveway and access is limited. Perhaps you are in a remote part of the country where additional transportation is required (think Waiheke Island). Or maybe labour is in short supply so you would have to use tradies from out of town; or labour is in high demand, and tradies are charging more. All these factors can contribute to the cost of rebuilding your home. If you want more guidance in estimating the replacement value of your home, you can use need2know or an online calculator. If you want a more personalised or detailed estimate you may want to hire a qualified Quantity Surveyor or Valuer to help. Q: Is the RV value on my rates bill my Replacement Value? A: The RV on your rates account is your Rating Value, this value bears no relevance to the Replacement Value of your home or its Sum Insured. Q: If purchased my house for $1,000,000 should I insure it for $1,000,000? A: The purchase price includes the land and takes into consideration other factors such as the location. It has no reflection on your replacement value. Q: I got a valuation when I brought the house, so I can I use this value as my sum insured? A: The valuation was most likely a market valuation which indicates the amount the property would sell for. It is likely the bank would have requested this to calculate the LVR, and it won’t include the replacement value. If you have an insurance valuation, this can be used as your sum insured. How can I insure my Multi Unit Rental Property?